District 1 – Both district playoff spots will be decided when the two Sunflower League teams meet this week. Shawnee Mission North snapped a 25-game losing streak two weeks ago and now will make their first playoff appearance since 2003. North will host top-ranked Shawnee Mission East with the winner advancing as the district champion and the loser going as the runner-up. 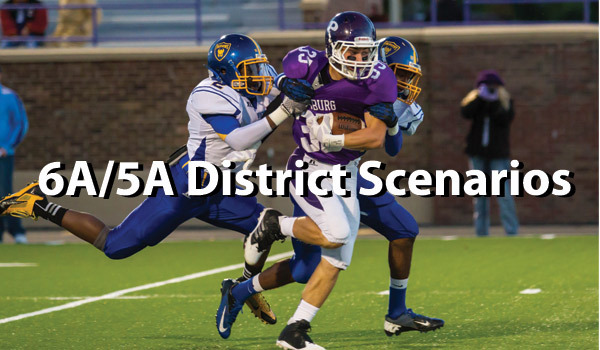 District 2 – All teams in District 2 still have a shot at the playoffs. Shawnee Mission West can clinch the district title with a win over Blue Valley North. Blue Valley North can win the district by beating the Vikings along with a SM Northwest win over SM South. The Northwest Cougars need to beat SM South and have SM West beat Blue Valley North in order to have a chance with the district points tie-breaker. District 3 – All four of these teams are still able to qualify for the playoffs. Blue Valley seemingly took control of the district with last week’s 49-0 shutout of Olathe South. The Tigers can wrap up the district title by winning at Blue Valley Northwest. Northwest can win the district title by beating Blue Valley and having Gardner-Edgerton beat Olathe South. Gardner-Edgerton has gone winless thus far, but the Blazers could get in the playoff mix with at least a 21-point win over Olathe South and a similar 21-point win by Blue Valley over Northwest. This district has the potential of having three teams tied with the same record and the same number of district points. Should that happen, the next tie-breaker is the team’s number of wins against opponents in their class and the next higher class (which doesn’t apply in this case). District 4 – Olathe North has clinched a playoff spot by beginning district play 2-0. Even should the Eagles lose to Olathe Northwest, Olathe North would still be among the top two finishers in district points and would reach the postseason. Lawrence can reach the 6A bracket with a win and a win by Olathe North over Northwest. Olathe East has been eliminated as even if the Hawks beat Lawrence, they cannot win the points tie-breaker should three teams finish 1-2. District 5 – Topeka High and Lawrence Free State have each already qualified for the 6A playoffs and will decide the District 5 championship this week in the state capital. The winner advances as the champion, with the loser going as the runner-up. District 6 – Junction City has won the District 6 title by virtue of wins over Wichita East and Wichita Southeast. East and Southeast play this week with the winner advancing to the playoffs. District 7 – Derby and Wichita West have each qualified for the playoffs. West will travel to Derby with the winner claiming the district championship, and the loser advancing as the runner-up. Wichita West is officially 2-6 on the season after forfeiting two early-season wins for the use of an ineligible player. District 8 – Wichita Northwest will travel to Hutchinson to decide the District 8 championship and both playoff spots. Garden City and Dodge City will play for the Hatchet, but neither will qualify for the playoffs. District 1 – Leavenworth will host Lansing to determine the District 1 championship game. The winner qualifies as the champion, while the loser qualifies as the runner-up. District 2 – The District 2 championship will come down to Shawnee Heights and Topeka Seaman. The T-Birds and Vikings will meet at Shawnee Heights with the winner advancing as the district champion. The loser qualifies as the runner-up. District 3 – Mill Valley is the district champion having beaten St. James Academy and Bonner Springs. The St. James Thunder and Bonner Springs Braves will play this week with the winner advancing as the district runner-up. District 4 – St. Thomas Aquinas has clinched at least a playoff spot, but can win the district title by beating Pittsburg. The Purple Dragons can get in the playoffs with a win over Aquinas or a loss by 12 or fewer points to Aquinas as long as Blue Valley Southwest beats Blue Valley West by 12 or less. Pittsburg can actually win the district with a win over the Saints and a Blue Valley Southwest win over Blue Valley West. Blue Valley West can get in with a win and a Pittsburg loss. For Southwest to get in, the Timberwolves need to beat Blue Valley West by at least 12 points and hope that Aquinas beats Pittsburg by 21. District 5 – Wichita Heights has clinched a playoff spot. Even if the Falcons lose to Kapaun Mt. Carmel by 21 points or more, they would still be in the top two in the district point tie-breaker. Kapaun can clinch a playoff spot with a win and the Crusaders would be the district champions with a win and an Andover loss. Andover must win and root for a Heights win over Kapaun to qualify. Emporia has been eliminated. District 6 – This district still has a lot to be decided. Salina South can clinch the district title with a win at Great Bend. Salina Central can clinch a playoff spot with an 8-point win over Newton. Great Bend can clinch ensure a playoff spot by beating Salina South by at least 15 points. Newton has already been eliminated. District 7 – Bishop Carroll has been dominant all season and the Golden Eagles have already clinched at least a playoff spot. Carroll can win the district by beating Valley Center. Maize South can reach the playoffs with a win over Maize and a Carroll win over Valley Center. Maize came into this season with high expectations, but have lost their first two district games. To qualify as the runner-up, the Eagles must beat Maize South by at least 15 points and hope Carroll beats Valley Center by at least 21 points. District 8 – This district is wide open heading into Week 9. Liberal can clinch the district title with a win over Ark City, while the Bulldogs can win the title by beating Liberal and a Goddard loss to Goddard-Eisenhower. Eisenhower must beat rival Goddard and hope for an Ark City loss to have a chance.